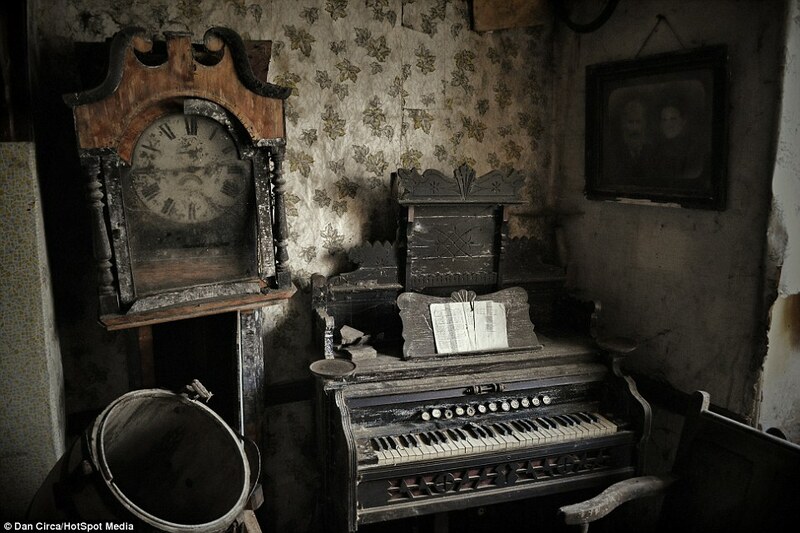 There’s something about abandoned houses that I find so fascinating. 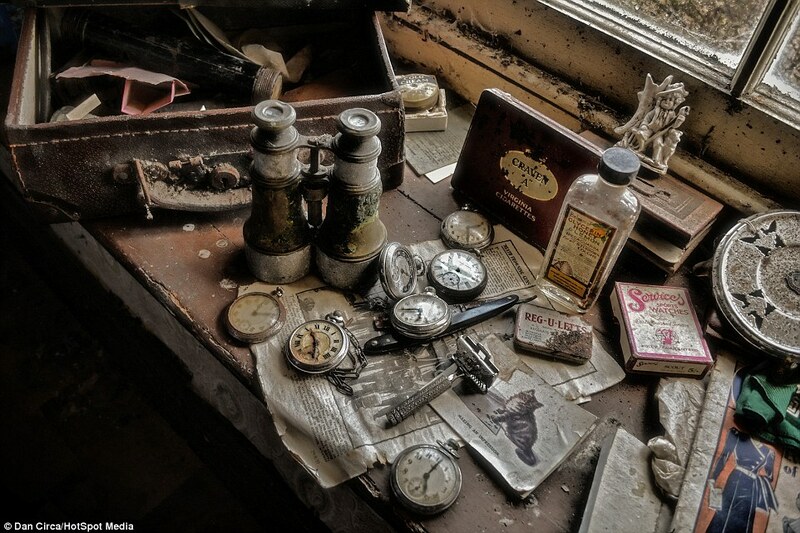 When I was a child I used to conduct my own archaelogical digs in the vegetable patch of our home – a former Georgian pharmacy – and collect boxes full of ‘artifacts’ for my collection. Glass lemonade stoppers, fragments of willow-pattern crockery, clay pipes and tiny bottles marked ‘poison’. There’s just something about holding an object in your hand that formed part of someone else’s life all those years ago. And it’s the mundane items that are more poignant, somehow. 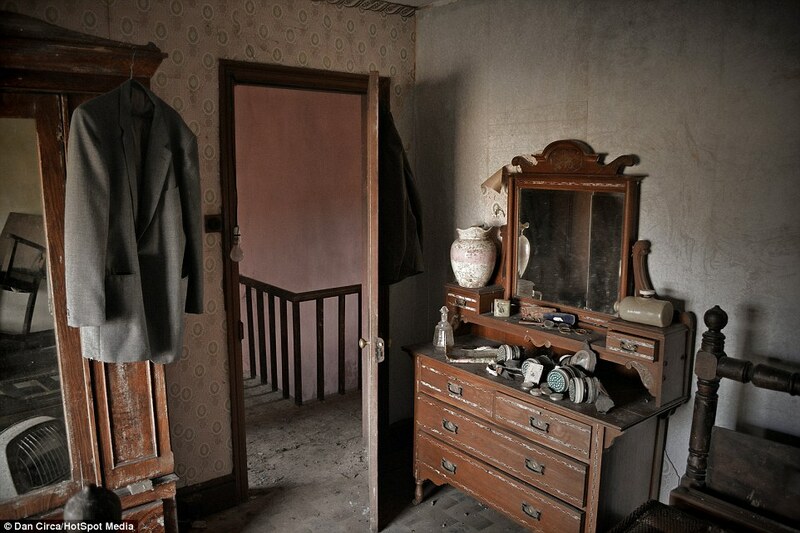 Last year, I posted a house tour of the abandoned Paris apartment of Madame de Florian, a 1940s socialite forced to flee her home as the Nazis approached. 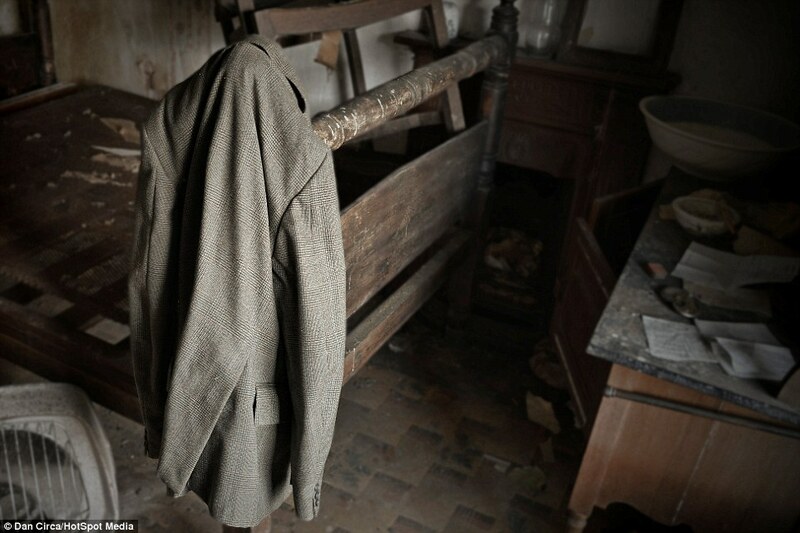 It has since become one of the most-read posts on Decorator’s Notebook so when I saw these magical photos of a recently discovered abandoned farmhouse in Wales, I knew you’d love to see. 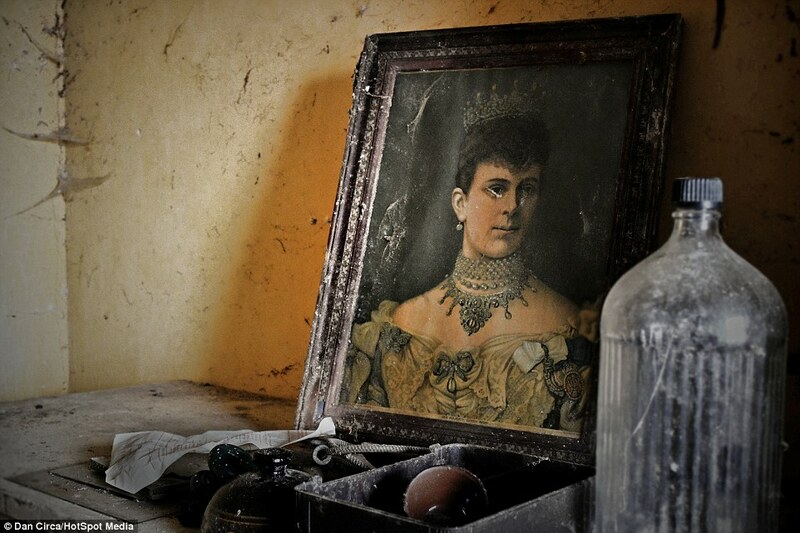 It couldn’t be more different to Madame de Florian’s home in terms of style, but gives an equally fascinating insight into life in the Welsh mountains many years ago. The farmhouse sits high on the hill and is known as the Cloud House to locals, since it is often enfolded with mist. Today, it stands frozen in the mists of time. What happened here? 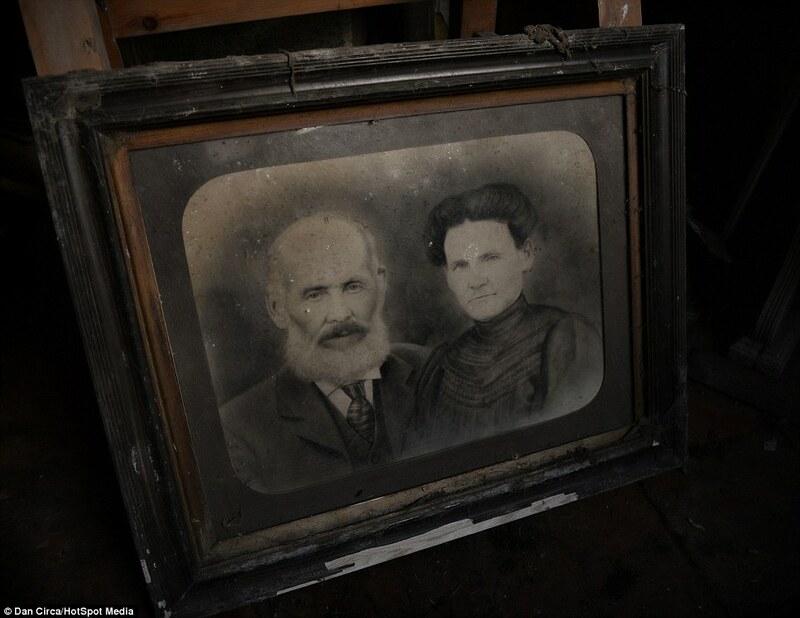 The identity of the former tenants is unknown, but we can get a glimpse of their lives from their possessions. Someone seems to have been a great collector of pocket watches, while another was a keen painter. 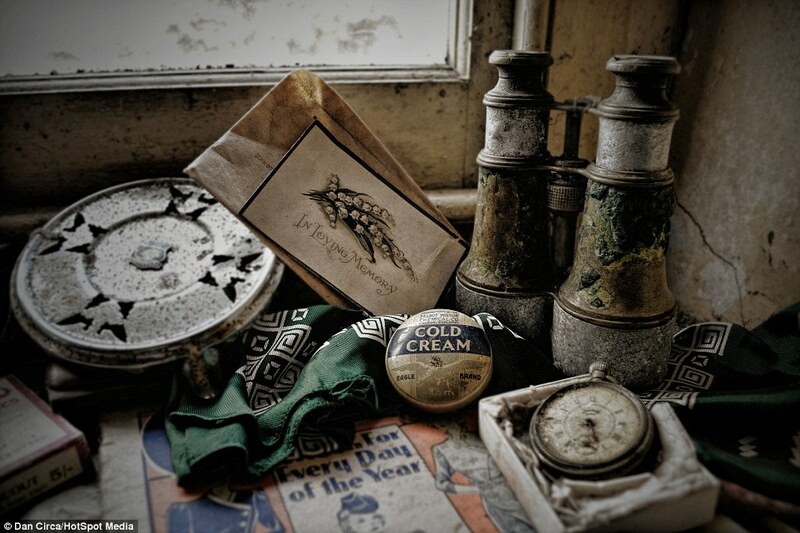 Peeling packaging labels and tins give us a clue that the house was probably abandoned in the late 1940s or 1950s. 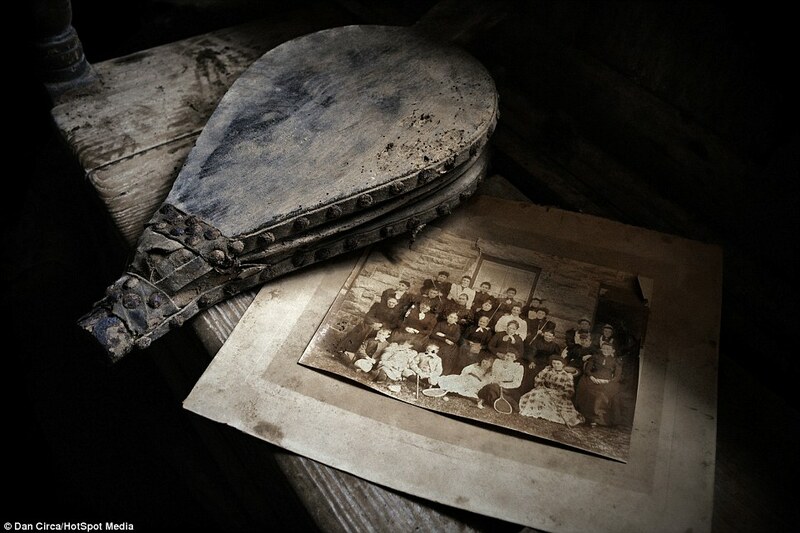 A few photos were found in the house, but no documents to identify the people in the pictures. There aren’t any children’s items, so perhaps the owners or tenants simply didn’t have anyone to leave their posessions to when they died? 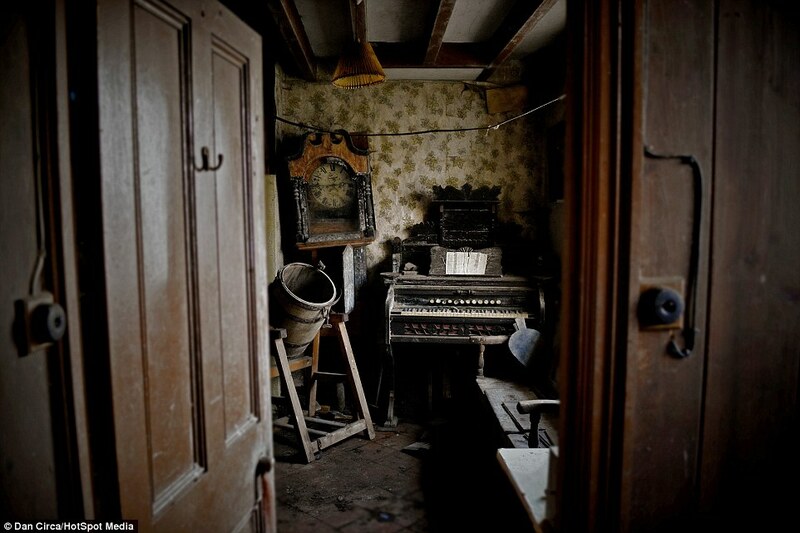 In one rooms sits a crumbling organ. Perhaps the residents and their friends gathered round it to sing together in happier times? I hope so. Why did they leave? Whatever it was, it seems they went suddenly, leaving their glasses and gas masks on the dressing table and jacket hung on the end of the bed. What do you imagine might’ve happened here? « How are indigo shibori textiles made? Oh I love it!! How fascinating, the jacket left on the end of the bed as if the owner is expected back any time soon, the glasses waiting for their wearer to pick them up and use them again…that feeling of time stopping in one place where all around the world keeps moving unaware. Best read of the day, thanks for sharing Bethan! I shall immediately read your earlier post on Madame de Florian. Oh how amazing, beautiful and sad. 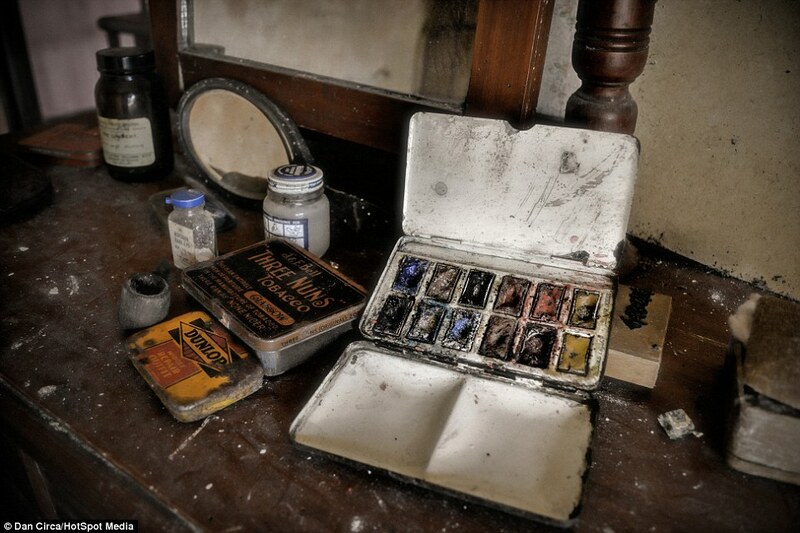 I want to touch everything, even though it looks so dusty I just want to handle all those watches and tins. 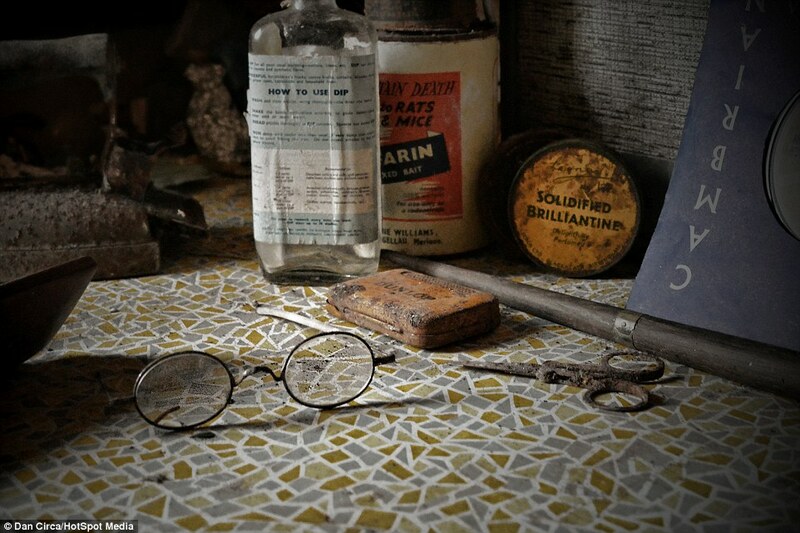 It’s very beautiful photography, I love the specs on the funky formica. Yes off to look at the Parisian one too. What a wonderful view into a life gone by. 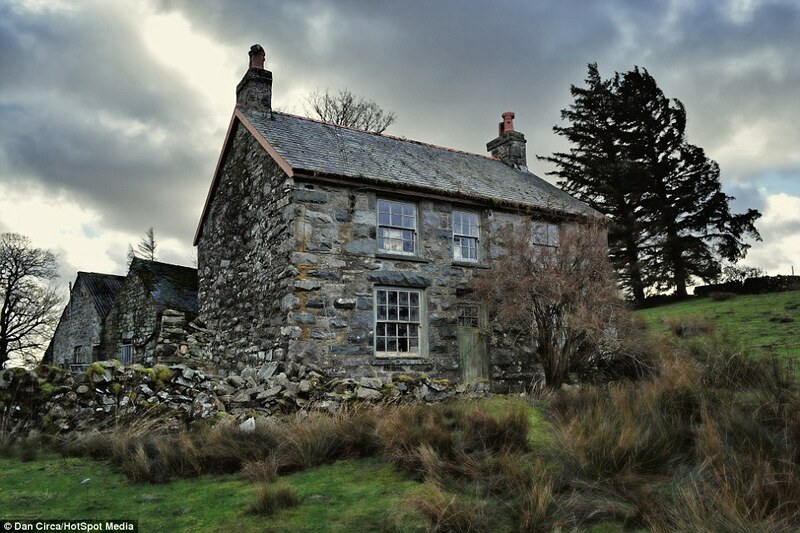 In addition to the interesting scenes inside, the cottage itself from the outside is a dream. “Cloud Cottage” is an immediate draw to those of us who fancy the mystery and simplicity of it all. If given an invitation, I would be on the plane in a moment to help clean up and clean out and package the treasures and then light the fire and live there for a few weeks – just enough time to live in the mist . Thank you. How interesting…what a story it tells..to bad family did not acquire the property and contents..sad how life can be..treasures to be passed down yet no one to enjoy them but strangers…however everything does not always fall into place…the past is so inviting and mysterious..! I have just discovered your blog and was captivated by this post. 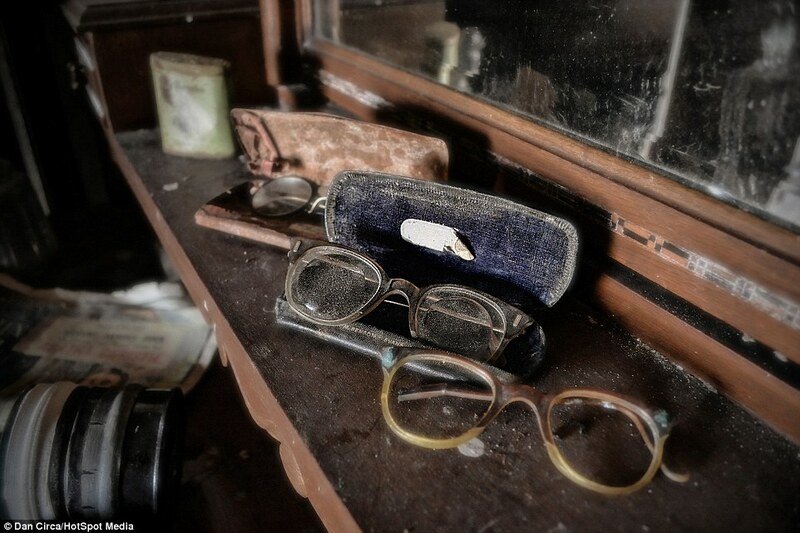 The remains of their lives is so poignant and affecting. 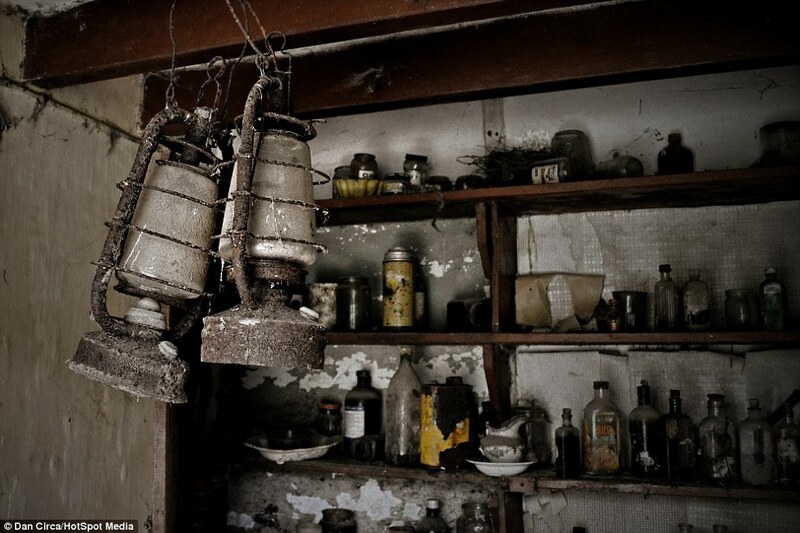 By looking at the photos it feels as if you are there, experiencing everything with the previous owners. Oh how I wish I could purchase this house, would just give it a good clean no alterations to spoil the beautiful look of the house. Any one know where this amazing place is? Yes, but don’t waste your time, I believe the place has been trashed and ransacked by idiots and since this happened, both the gate up to the place and the cottage itself have been locked up tight. Yes, it is. I visited the place whilst I was on Holiday in Bala in March, and you can’t get in now, the very fact that the farm gate on the road is now double locked with the addition of barbed wire is proof that somebody is keeping an eye on the place and its obviously owned by that somebody, and so perhaps not as mysterious or abandoned as has been made out in a lot of places, perhaps overlooked and neglected might be more accurate but its certainly somebodies’ property, even if they choose not to live there or look after it. Unfortunately in the last 12 months there have been several high profile urban explorers who have published videos of their explores on Youtube, with 100,000’s of views, inevitably that type of exposure will attract the smash, burn and steal element of society, and then that’s one less place for those of us who leave as they find, to visit.